From its imperial palaces, Zen gardens and Shinto shrines to the traditional wooden buildings and screen facades of downtown Gion, Kyoto is a city that very much embodies the spirit of old-world Japan. Visitors to Kyoto can learn all about the art of tea, Zen Buddhism and many other pillars of Japanese culture, whilst getting the chance to visit otherworldly bamboo forests and ornate shrines, all within the borders of this mysterious yet welcoming city. The experts at Rickshaw Travel have put together a list of the best sights to see, places to go, food to eat and experiences to have to make the most of your once in a lifetime trip to Kyoto. Step back a few hundred years in history as you wander through the winding alleyways of the Gion district. As you explore the simple wooden buildings, demure teahouses and distinctly Japanese restaurants, you’ll find a cultural, interesting and well-rounded view of Kyoto. The last working Geisha district left in Japan, Gion is the only place in the world where you can see these mysterious elegant female entertainers practice their craft. The renowned Minamiza Theatre is the perfect place to see the poised ‘dance of the maikos’ (apprentice Geisha), as well as other Japanese traditional arts such as tea ceremonies and kabuki shows – a genre of theatre that features dance, dramatic make-up, and bright vivid colours. Lined with traditional restaurants and shops, and no modern buildings, cars or gaudy signs allowed, Pontocho Alley runs parallel to the west bank of the Kamo-gawa River between Sanjo and Shijo. It is one of the most atmospheric streets in all of Kyoto and a great place to spot Geisha at dusk or sample authentic, incredible Japanese cuisine. Whilst wandering down lantern lit streets, you will notice the closed screen facades of the restaurants with flickering candlelight under the door and the outside menu entirely in Japanese. Be sure to try Pontocho Fujita, a family run Kyo-kaiseki restaurant that serves exquisitely presented dishes of pike conger and puffer fish, and Yoshiya, a popular kappo restaurant serving sashimi, tempura and stewed dishes. The self-styled ‘Kitchen of Kyoto’, Nishiki Food Market is a great place to go to try Japanese delicacies. A mecca for food lovers, scan the stalls where all kinds of fresh seafood, dumplings, pickles, roasted tea, fish cakes, and yakitori can be discovered. Most stalls sell food at the front of their stores particularly aimed as tourists who want to enjoy the popular pastime of “Tabe-aruki” (walking and eating). Like the British the Japanese love a good cup of tea, although for them it is more about the preparation than the drinking. Tea ceremonies, known as chado or sado, are available all over Japan, but experiencing one in Kyoto is extra special due to the city’s strong Zen Buddhist roots. The ceremony begins with the graceful cleansing of the tea utensils, the tea is poured carefully and artfully and you are presented the cup with a gentle ceremonial bow. The ceremony itself is deeply spiritual, and as you sip the delicate tea you are subtly encouraged to be mindful and thankful of your place in the world. En, a small teahouse in Gion with tatami tearooms, has English speaking Kimono-clad servers and is ideal for first time visitors looking to experience the unique art of Japanese tea. Experience a true state of zen at the famous dry rock garden of the Ryoan-ji Temple, the original garden of contemplation. Unlike any other, this karesansui dry landscape garden has 15 mysterious rocks floating in a sea of pure white sand, academics claim the garden depicts an ocean accented with small islands or sky dotted with clouds. With its simple calming design, and innate mystery, there is certainly plenty to contemplate at Ryoan-ji. Featuring a picturesque, circular promenade around a Sogen Pond and framed by the scenic mountains of Arashiyama, the landscape of the Tenryu-ji Temple is reminiscent of a painting. Located in the western outskirts of the city, it’s one of Kyoto’s great Zen temples and this stunningly idyllic garden has been designated a ‘Special Place of Scenic Beauty’ in Japan. Famous for its entirely moss-covered garden, the less traditional but no less tranquil garden of the Saiho-ji temple is one of the most celebrated in all of Japan. Known as Koke-dera, the ‘Moss Temple’ garden is arranged as a circular promenade centred around a golden pond and surrounded by a lush green garden and complete with three tea houses making it the perfect spot to rest, relax and reflect. One of the most unusual landscapes in the world and one of Kyoto’s best-known attractions, The Arashiyama Bamboo Grove rivals any manicured garden for a sense of otherworldliness. Although technically not a garden, the thick green bamboo stalks reach up and up to the heavens, rustling and swaying back and forth in the breeze and distorting the light, creating an eerie but nevertheless calm and Zen atmosphere of being somewhere else entirely. With 2000 (or so) temples and shrines, many of which are UNESCO World Heritage sites, Kyoto has an embarrassment of sacred riches not to be missed. Kinkaku-ji, otherwise known as the Golden Pavillion, is artfully set amidst a calm lake surrounded by trees, with the Zen temple itself wrapped entirely in gold leaf, the breath-taking temple is an elegant three-tiered golden pagoda with its reflection shimmering in the water. Set on a beautiful hilltop, Kiyomizu-dera Temple (Pure Water Temple) requires a pilgrimage-like journey up the steep, bustling lanes of Higashiyama District, once at the top an iconic red arch awaits with remarkable views across a hillside of cherry and maple trees. The temple complex has an array of enchanting features. Visitors can drink the stream water, which is believed to have wish-granting powers, or attempt to successfully walk from one ‘love stone’ to another – with eyes closed – at the Jishu Shrine, dedicated to God of love Ōkuninushi. 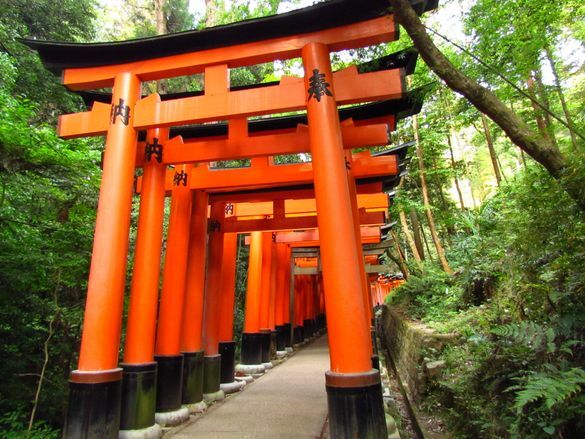 Uniquely Japanese, the Fushimi Inari-taisha Shrine sits at the base of a mountain and can be reached through a flamed coloured walkway comprised of thousands of traditional red torii gates. Secret Shinto shrines and various offshoot pathways surround the mountain, with incredible views of Kyoto at the Yotsutsuji Intersection. The shrine honours the Shinto god (or Kami) Inari, the god of foxes, rice, tea and sake, who merchants and manufacturers have traditionally worshiped as the patron of business. You can easily spend a day here wandering through the trails and exploring the network of ornate shrines. Be spirited away as you pass under gate after gate after gate, steered by red vested fox statues, who represent the sacred messengers of Inari.